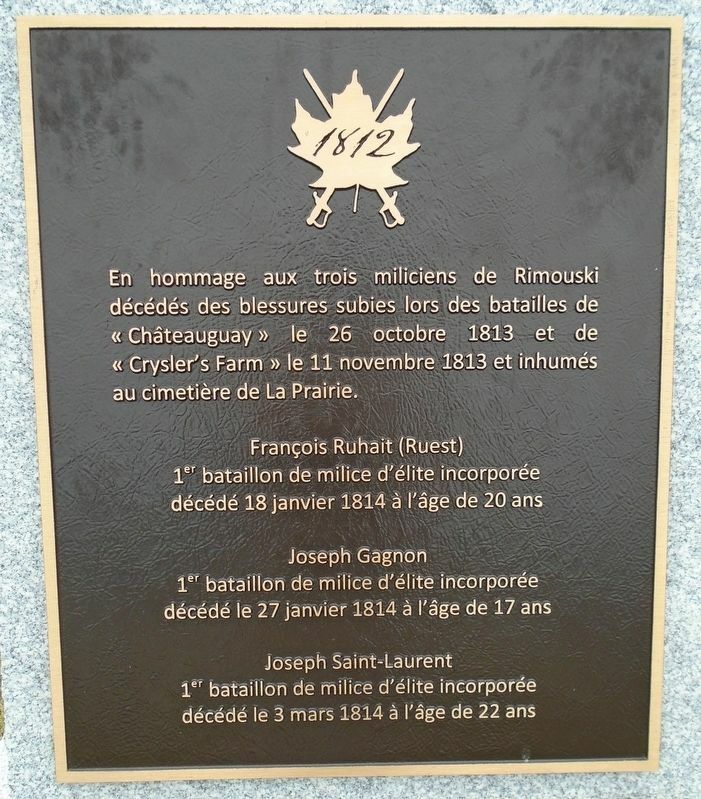 In tribute to the three Rimouski militiamen who died from wounds received in the battles of "Chateauguay" on October 26, 1813 and "Crysler's Farm" on November 11, 1813 and were buried in La Prairie Cemetery. En hommage aux trois miliciens de Rimouski décédés des blessures subies lors des batailles de « Châteauguay » le 26 octobre 1813 et de « Crysler's Farm » le 11 novembre 1813 et inhumés au cimetière de La Prairie. Location. 48° 26.806′ N, 68° 32.217′ W. Marker is in Rimouski, Quebec, in Rimouski-Neigette MRC. Marker is on boulevard Rene Lapage Ouest (Quebec Route 132), on the right when traveling east. Touch for map. Monument is on the Veterans Plaza. Marker is at or near this postal address: 225 rue Saint-Germain Ouest, Rimouski, Quebec G5L 4B9, Canada. Touch for directions. Other nearby markers. At least 8 other markers are within 6 kilometers of this marker, measured as the crow flies. Défense du Canada / Defense of Canada (here, next to this marker); Monument commémoratif de guerre / War Memorial (here, next to this marker); Seigneur René Lepage de Sainte-Claire (within shouting distance of this marker); Le Manoir Seigneurial (about 150 meters away, measured in a direct line); Les maisons de colonisation / Settlement Houses (approx. 5.2 kilometers away); La maison du commerce / The House of Commerce (approx. 5.2 kilometers away); Maisons d'aujourd'hui / Today's Houses (approx. 5.2 kilometers away); Les maisons de notables / Noteworthy Houses (approx. 5.2 kilometers away). Touch for a list and map of all markers in Rimouski. More. 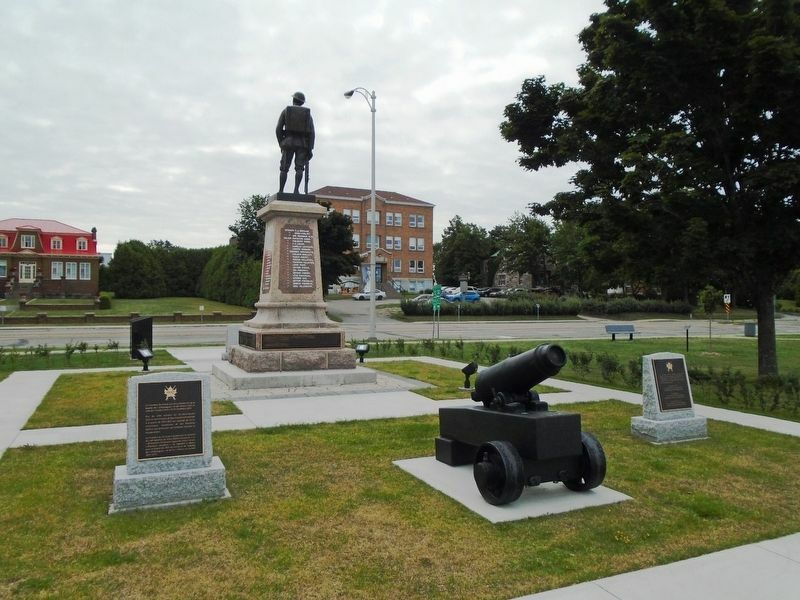 Search the internet for Rimouski War of 1812 Honored Dead. Credits. This page was last revised on November 24, 2018. This page originally submitted on November 24, 2018, by William Fischer, Jr. of Scranton, Pennsylvania. This page has been viewed 53 times since then and 6 times this year. Photos: 1, 2. submitted on November 24, 2018, by William Fischer, Jr. of Scranton, Pennsylvania.